In December 2012, the Globally Harmonized System of classification and labeling of chemicals came into effect and is now being used world wide. You are required to train your employees regarding the use of this new system. 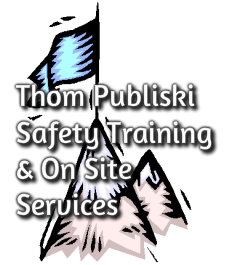 Contact Us for GHS Training options! 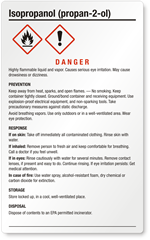 In the new Globally Harmonized System, there are pictograms that are similar to that of the old system, however important changes have been made that your employees should be aware of! 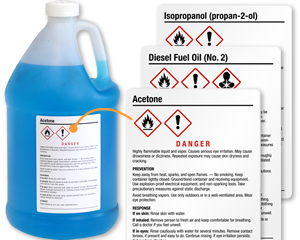 This is an example of a label that can be used when transferring chemicals into new containers. It's purpose is instruct employees of the possible hazards that may be present, and the steps to take toward keeping themselves and others safe. 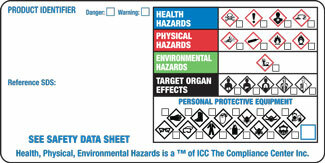 New SDS sheets replace the old MSDS sheets and have a GHS standardized format composed of 16 sections. It is important for employees to be trained in these changes so that they'll have the ability to find the information they need easily.